format 21 by 15 cm, book in paper-covers, coloured cover, tissue-paper dust jacket, 128 pages, 87 black and white reproductions. The catalogue consists of an essay written by Emanuele Bardazzi dedicated to the Florentine years of De Carolis and is enriched by the publication of 89 unedited letters from the artist to the painter and engraver Giovanni Guerrini (1887 - 1972). 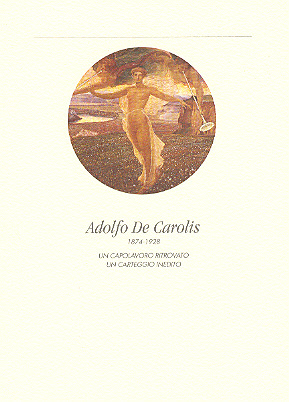 The publication of the correspondence has been introduced and edited by Carlo Fabrizio Carli.